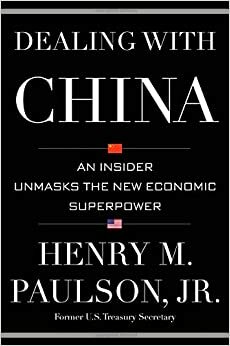 In his book, Dealing With China: An Insider Unmasks the New Economic Superpower, former United States Treasury secretary Henry M. Paulson, Jr. provides readers a glimpse into the political relations he developed with senior officials in China during his time as chairman and chief executive officer at Goldman Sachs. The book is reviewed by Alex Verkhivker. As President George W. Bush’s Treasury secretary from July 2006 through January 2009, Henry Paulson was the president’s leading policy adviser on both domestic and international issues. During this time, Mr. Paulson spearheaded U.S. – China relations and advocated for competitive and liberalized capital markets in China. Before joining the Treasury Department, Mr. Paulson had a 32–year tenure at the venerable investment firm, Goldman Sachs. During these three decades, Paulson developed intimate relations with China’s political elite, including Presidents Hu Jintao and Xi Jinging as well as its banking giants, most notably the Industrial and Commercial Bank of China’s chairman Jiang Jianqing. As head of Goldman Sachs, Mr. Paulson details in riveting tone how China was opened up to private enterprise. The book opens with a narrative outlining Paulson’s first trip to Hong Kong after being named one of three co-heads of Goldman Sachs’ investment banking division towards the end of 1990. At the time, all banks were fixated on China Telecom, which was set to make an unprecedented public offering of its shares in both Hong Kong and New York. With the deal valued at over $4 billion, every investment firm wanted to win. The ultimate restructuring of China’s telecom industry went to Paulson and his team at Goldman Sachs and by 2008, China had amassed three large, competitive national carriers that were able to compete against one another. Reading Mr. Paulson’s twists and turns in leading Goldman employees halfway around the globe to finalize the deal gives one an insider’s perspective not only to the banking industry, but to how deal-making is done internationally with huge stakes. The work required to attract investors, meet listing regulations and abide by international laws is endless and immense in proportion. The China Telecom deal helps propel Mr. Paulson’s broader message for his readers: when America is able to negotiate intelligently with China for greater market liberalization and competiveness, both China and the United States benefit. In fact, Paulson points out that China is America’s most important economic partner and that it is America’s responsibility to cooperate with China for the betterment of both nations. As a student of China’s culture and history, I found the book uniquely interesting because it was able to narrate China’s economic and social transformation by revealing the good and bad of how China’s most senior statesmen make their decisions. A particularly noteworthy chapter is “A Global Reckoning,” which recounts the financial crisis through the lens of the Chinese. Paulson writes of his time in China the two weeks before Fannie Mae and Freddie Mac were placed into conservatorship by the U.S. Treasury. While in Beijing, Mr. Paulson was notified that Russian officials approached the Chinese with the idea that together the two powers could sell off some of their securities in Fannie and Freddie. The transaction would force America to use emergency reserves to prop up these two government-sponsored enterprises. The fact that China ignored Russia’s bait and continued to work with America by holding onto American securities during the crisis illustrates the importance of a sustained partnership between the U.S. and China. The delicate balance between reforming China’s economic system and cooperating with their political system sheds Henry Paulson as a true diplomat. As the U.S. Treasury Secretary during America’s worst financial crisis since The Great Depression, Henry Paulson acted in ways that reflected China’s realities. His dealings reflected the economic facts of China’s capital markets rather than wishes or dreams of an executive wanting to fix China’s growth model to resemble that of America’s. As the primary dealmaker with China, Henry M. Paulson made his approach one of trying to find more ways to say “yes” to China’s efforts at rebalancing its economy rather than forcing China to adopt American ideals. Dealing With China is Henry Paulson’s primer for deal-making with China. The economic woes in China have a storied history and although the majority of the book deals with banking reform, a good portion is devoted to a topic many readers are most likely unaware of: Henry Paulson’s conservationism. As chairman of the board of directors of the Nature Conservancy, Paulson’s passion for sustainability shines during his writing of climate change and the challenges presented with conserving China’s coastal wetlands, maintaining energy security and lowering carbon emissions. As with economic reform, the message resonates clearly: it will be easier to tackle energy reform if both China and America work in complement to one another rather than in conflict with each other. The way forward, suggests Paulson, is to “find China a better seat at the table.” America should want China to have a stronger leadership position in international groups like the World Trade Organization, the G20 and the Inter-American Development Bank. Having China work with other developed nations and banking institutions will encourage Chinese corporations to observe stringent social as well as environmental standards. This could only pay dividends for America’s interests. In making the case for China needing to find a better seat, Dealing With China is an opportunistic and creative dialogue on the possibilities China and America could foster for themselves by maintaining a resilient partnership. After decades of negotiations with China, Henry Paulson has written a tour de force on how to effectively deal with China. Alex Verkhivker is a contributor to Capital Ideas at The University of Chicago Booth School of Business. In prior work, he has worked as an economic researcher with the Federal Trade Commission in Washington and as an Associate Economist at the Federal Reserve Bank of Chicago. He has written for the Becker Friedman Institute For Research In Economics at The University of Chicago, United Kingdom Centre for Policy Studies CapX, Forbes, Huffington Post, Washington Examiner, The Times of Northwest Indiana and Economics 21 – the economics portal of the Manhattan Institute for Policy Research. Alex holds degrees in economics and management from The University of Chicago and UCLA, respectively. You can follow him on twitter @averkh.